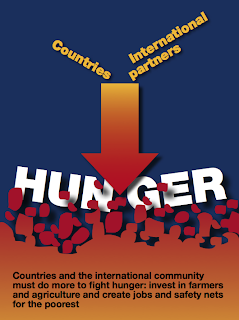 I came across some hunger facts recently and I want to share them with you. Most of these came from the report titled, The State of Food Insecurity in the World published by the Food and Agriculture Organization (FAO) of the United Nations in 2012. 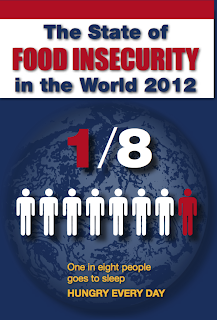 About 870 million people are estimated to have been undernourished in the period 2010–12. This represents 12.5 percent of the global population, or one in eight people. The vast majority of these – 852 million – live in developing countries, where the prevalence of undernourishment is now estimated at 14.9 percent of the population. Undernourishment in the world is unacceptably high. 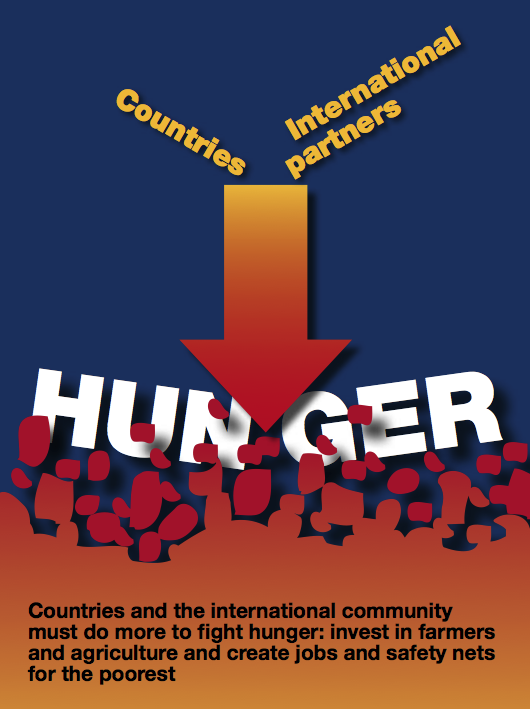 The global number of hungry people declined by 132 million between 1990-92 and 2010-12, or from 18.6 percent to 12.5 percent of the world's population, and from 23.2 percent to 14.9 percent in developing countries - putting the MDG target within reach if adequate, appropriate actions are taken. Asia and the Pacific have the largest share of the world's hungry people at 563 million but the numbers have been going down for decades due to regional economic growth. Undernourishment decreased by 30% in the past two decades and despite population growth in the region, the prevalence of undernourishment decreased from 23.7% to 13.9%. Developed regions also saw the number of hungry rise, from 13 million in 2004-2006 to 16 million in 2010-2012, reversing a steady decrease in previous years from 20 million in 1990-1992. The report also noted that strong economic growth is important in the fight to reduce hunger. Regions that experienced growth in the past decades also rapidly reduced hunger incidence. However, economic growth must reach and involve the poor through increased employment and other income-generating opportunities. One of the areas the report pointed out is agricultural growth which is particularly effective in reducing hunger and malnutrition in poor countries since most of the poor depend on agriculture and related activities for at least part of their livelihoods. Women should also be involved in these development, the report said, since they have more control over household income and more money tends to be spent on items that improve nutrition and health. The report further suggested that social protection systems are needed to ensure that the most vulnerable are not left behind and can also contribute to and benefit from economic growth. Programs such as cash transfers, food vouchers or health insurance are needed for the most vulnerable who often cannot take immediate advantage of growth opportunities. Social protection can improve nutrition for young children - an investment that will pay off in the future with better educated, stronger and healthier adults. 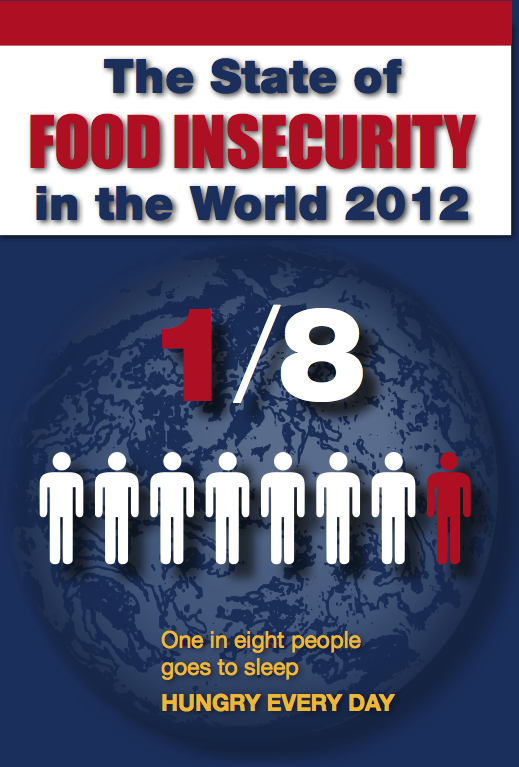 With effective social protection complementing inclusive economic growth, hunger and malnutrition can be eliminated. You may download the full report from the FAO website here.